Evan Easton-Calabria is a researcher on the Rethinking Refuge project. Prior to this (until December 2018) she worked on the Refugee Economies Programme's research project on refugees’ bottom-up social protection. Her work with refugees began in Kampala, Uganda, in 2011 and has led her to research historical and contemporary refugee self-reliance assistance. While living in Uganda, she co-founded a grassroots organisation with refugees in Kampala that provides livelihoods training and support to urban refugees. This ongoing work has provided her with an invaluable insider lens on refugee-led initiatives. 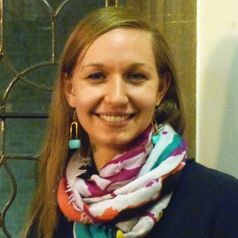 She has recently completed her DPhil in International Development, tracing the changes and continuities of refugee self-reliance assistance and refugees’ involvement with development since the 1920s. In 2015 she was Principle Investigator for the National Geographic Young Explorer’s project ‘Innovation and the Art of Self-Reliance: Artistic Livelihoods of Kampalan Refugees’ and in 2015-2016 for the research project ‘Researching Refugee-Run Micro-Finance’ funded by the Humanitarian Innovation Fund. Through academic research and piloting grassroots self-reliance projects with refugee communities in Kampala, she aims for her work to contribute to Refugee Studies and inform contemporary refugee policy on livelihoods and self-reliance.